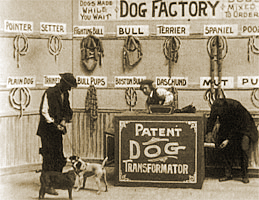 Two men are operating a ‘dog factory’, using a device that they call a Dog Transformator. A man brings three dogs into their shop, which they purchase from him. They place the dogs one by one into the machine, which turns each dog into a string of sausages. As their customers come in, they are then able to select the kind of dog that they want, and the machine changes the corresponding string of sausages back into a dog.